Which Containment Sheeting System Works Best? One of the key requirements for scaffold sheeting of all types is to create containment of dust, debris or fumes around a building project. We see this requirement most typically on refurbishment type projects where some kind of blasting is being used as a surface preparation. This might be a building where the stone facade is to be blasted clean or a bridge where the metalwork needs blasting back prior to re-painting. Where blasting is required the sheeting stops the blast materials escaping into the local environment and allows residues to be contained in a specific area for collection and disposal in a safe manner. 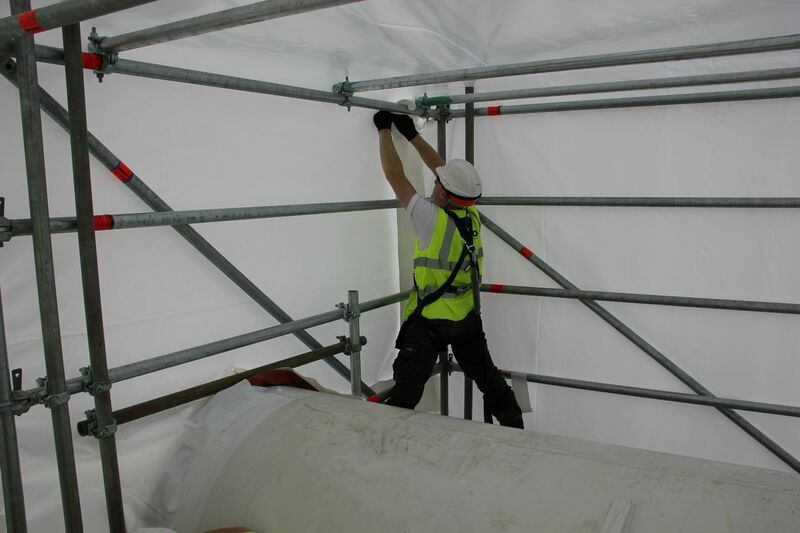 Projects that require high levels of containment present special challenges for a scaffolder or contractor. To demonstrate the difference between traditional scaffold sheeting and shrink wrap sheeting when it comes to the containment of potentially hazardous dust and debris, we decided to do a test. 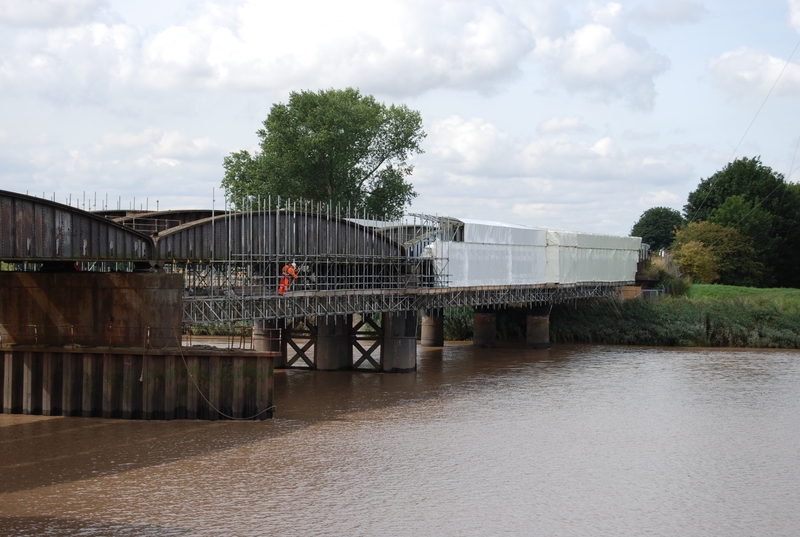 First we wrapped a scaffolding structure in traditional ‘individual sheet’ scaffold sheeting. Smoke grenades were placed inside the containment tent and the results filmed. Then we wrapped the same scaffolding structure in shrink wrap sheeting and released the smoke grenades. Watch the video to see how the products compared. Which Type of Sheeting Should I Use? For the complete encapsulation of scaffolding there are two options. The first option is to use the ‘traditional’ conventional cladding seen on many sites around the UK. This sheeting is typically supplied as a 2m-3m wide roll which is fixed on a ‘lift by lift’ basis around the scaffolding structure. If you need to create containment around a construction project the joints between sheets are critical. 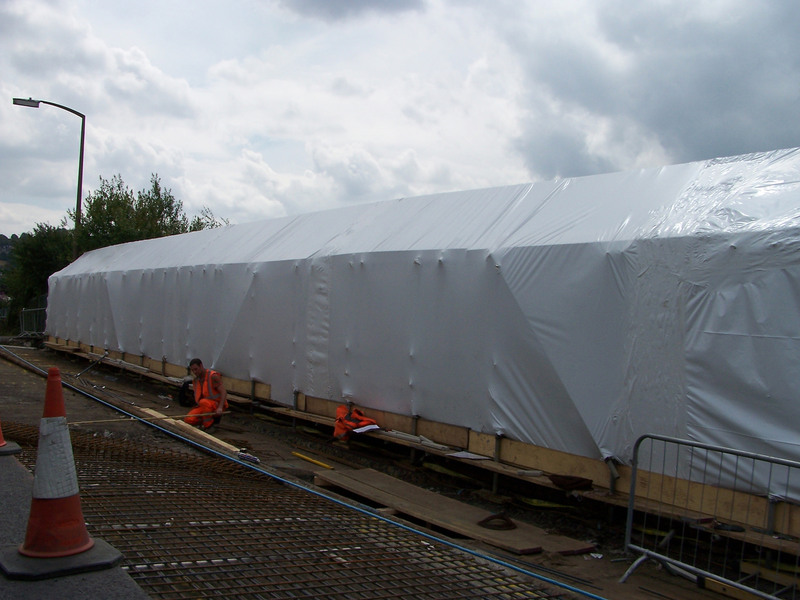 With conventional ‘individual sheeting’ such as Monarflex the advice for containment is to overlap the lower sheet externally for weather protection and internally for containment. This type of sheeting is attached to the scaffolding using bungee ties which are pushed through the sheeting and then ties around a scaffold tube. 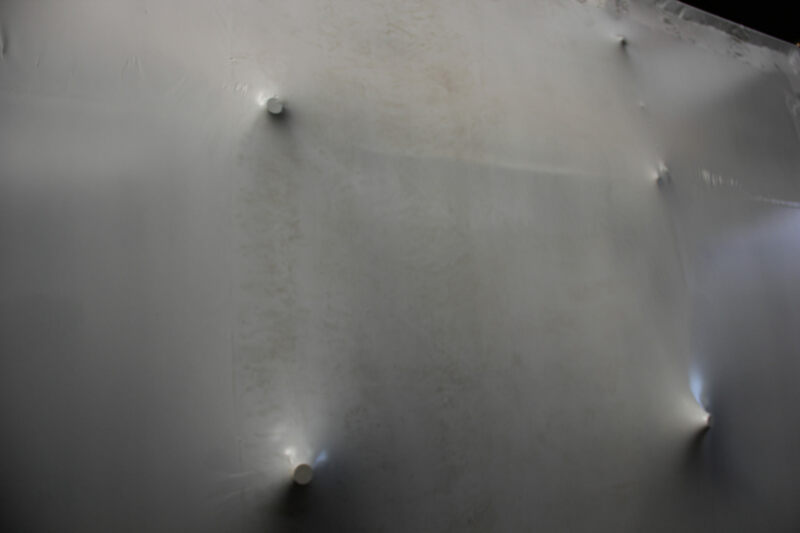 This means that the very act of attaching the sheeting is creating small holes where dust may escape. Although this hole might seem small, the pressure of the blasting operations will force residues out. Although conventional scaffold sheet is great for sheltered building projects or where protection is needed for the short term, most traditional sheeting products are designed to begin to detach at wind speeds / gusts of 40mph. The problem is not so much the sheeting itself but the method of attachment – the bungee ties. These ties tend to quickly lose their elasticity. When this happens the sheet starts to become loose and sag which leads to more flapping and even more stretching of the ties. In extreme cases the sheeting may detach altogether. Where the sheeting is providing basic screening this will be an inconvenience. Where the sheeting is providing a barrier against environmental contamination of the local area, detaching sheeting can be a major problem. The problem is not so much the sheeting itself but the method of attachment - the bungee ties. These ties tend to quickly lose their elasticity. Rather than simply overlapping and taping, all joints between sheets of scaffold sheeting are created by overlapping and then using the a heat gun to create a welded joint. This method creates a bond which is a strong as the original material and has the effect of creating a continuous containment skin around any size or shape scaffolding project. Instead of using elasticated bungee ties, shrink wrap sheeting is attached by wrapping it around a scaffold tube and heat welding the sheeting back on to itself. In addition to being very strong this method also has the benefit of not deteriorating over the months which makes shrink wrap sheeting particularly useful for long term projects. Any discussion of a project that needs to contain something usually involves looking at ‘final seal’. Final seal can create quite a challenge. This describes the interface between the sheeting and the wall / ceiling / floor. The easiest type of containment is on internal projects such as a temporary actor partition. In this case the scaffolding is erected so that a tube is run parallel to the surface. 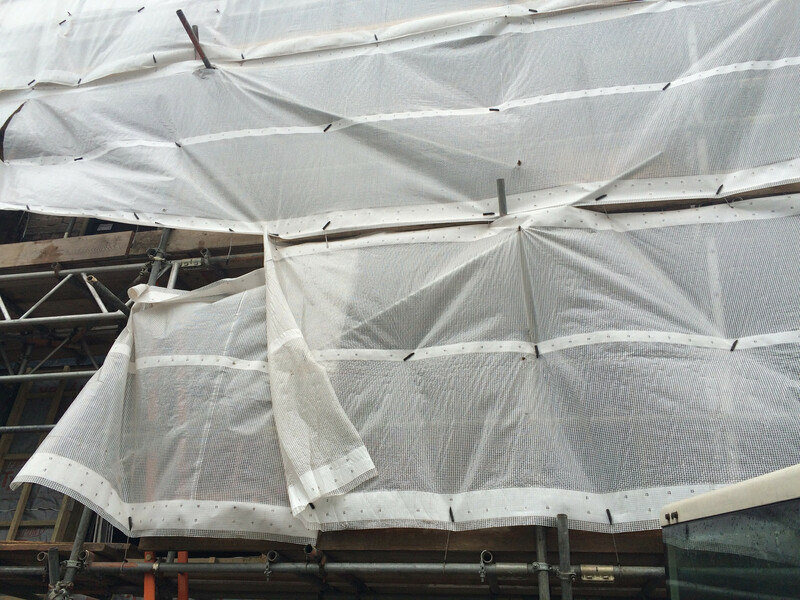 The shrink wrap is then wrapped to the scaffolding in the normal way. A skirt can then be fixed from the sheeting. If the surface is suitable, i/e/ smooth, clean and dry then this skirt can be taped into position and the final seal has been created. However, in many cases, it may not be possible to simply tape a skirt into position. Powerful adhesives can be used although it must be noted that these can leave behind a residue which may be difficult to remove – certainly not ideal for heritage projects. A reliable way of creating a final seal between the shrink wrap sheeting. Often a wooden batten will be used to fix the sheeting to the toe board or boards on the lowest lift of the scaffolding. Typically, ‘Cordeck’ or similiar will then be laid over the boards. What are some disadvantages of shrink wrap containment sheeting? For any construction project where the sheeting is important, paying special attention the the structure will be beneficial. For containment, the scaffolding structure must be flush – i.e. with no protruding ledgers, handrails, transoms or scaffold boards. Although sheeting can be cut around protrusions, and resealed using tape, it is always difficult to maintain 100% containment or weather proofing in this scenario. Protruding tubes also affects the appearance of the finished job! For more information on setting up the scaffolding structure ‘click here’. Traditional scaffold cladding is a low cost way to provide basic containment around a project and is a great choice where the containment is not critical and is only required for relatively short term projects. For a higher level of containment, the sealed joints of shrink wrap sheeting provides a more effective seal and because it does not use bungees, the sheeting will remain as tight as the day it was installed. Of course for best results the scaffolding structure needs to be right and you need to ensure you or your sub contractor are using a high quality sheeting that has been specifically engineered for scaffolding and that it is being installed by competent operatives.